Sounds like a good name for one of the many shades of beige I have looked at lately. Paint paint paint, I swear that's all I do lately. Some people say go with beige/off white - make your house a blank canvas for potential buyers. Others say it's just too boring and people want to see color. I say you can't paint your whole house any one way and please everyone so we are doing a little of both and steering away from anything too wild and crazy. Luckily many rooms just need touch ups but with some we are picking new colors. 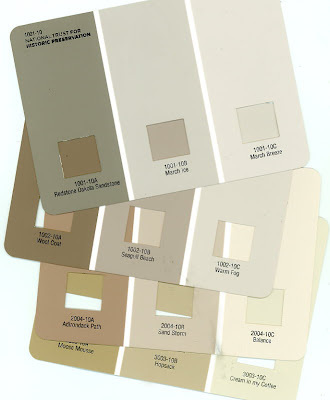 And yes, one will be beige which is why I have all these swatches. Me, I like to debate about a color for, like a year, before I take the plunge with it, that's just me. Not having that option has been a little unerving for me. How do you all pick room colors? I have played around a bit over at the Behr website where they have lots of fun tools for picking and visualizing colors. I would never make a color choice for a room based only on what I saw on a website - I just don't trust the consistency - but it is fun. I think it could be really helpful when choosing a color scheme for an embroidery project. I would love to hear any tips and advice anyone has about putting a home on the market/staging/keeping your sanity through it all. I need all the help I can get! Beige HAS to be the hardest color to pick. I've painted my bathroom 3 different beiges and not liked one of them. In my experience the only way to tell what you like is to paint a swatch on a big wall in your room. Also, take a look at the more saturated version of the color - is it really pink, or blueish or brown - that shows the color underlying the beige and is the tinge it will have when it gets on your walls. I definitely had a more difficult time picking a light, neutral color than I've ever had picking something with COLOR. I had no idea how much impact the undertones in beiges and whites could have on a room! We ended up using Sherwin Williams "Crisp Linen" (6378) in our kitchen, living room, and dining room -- and it's what we'll use when we repaint the hallway and bathroom. I wouldn't hesitate to use it when putting a house on the market. Nice and neutral, but not boring (in my opinion). (1) Put a great deal of their furniture and "stuff" into storage. When staging to sell, you want less furniture in the house than you'd have in it for "living in it" purposes. You want lots of room for people to mill about without having to squeeze through and around stuff. (2) Put away personal pictures, knick-knacks, and collections, even in kids' rooms. Don't load down bookshelves -- you want to be able to see the inside back of them. You do want to have *some* things on the walls and sitting around, but less than most people have out for "living in it" purposes. I bet you could find some great staging tips on HGTV's website. I had a homeschooling friend who had her house on the market for a year-plus. Homeschooling with three boys meant they needed to be able to get to their stuff during the day, yet not have so much stuff around that it was hard for potential buyers to *see* the space. She said the hardest part was keeping the house close to "time for a showing" clean. She asked her realtor to schedule closings for later in the day so she and the boys could have access to the house for most of the day, and required at least an hour's notice before a showing so she could run the vaccuum, wipe down counters, throw dishes in the dishwasher, etc. and be able to gather up her boys and head to the park. She said she wiped down the bathroom and vaccuumed the house every night before bed and decluttered nightly, so that the hour before a showing could be spent doing quick neaten-up stuff rather than deep cleaning. In theory, a realtor should let you know what needs to be done so your house will appeal to a broader market. In reality, I don't think they all do that. If yours hasn't, it might be worth having one that's more aggressive come do a walk-through. In addition to these ideas (even the turquoise) I made sure I had a fresh modest bouquet of flowers in the living room and a subtle scented candle in the main bathroom. These touches helped to make the house have a freshness to it. Many, many blessings on the entire process of selling and moving for you. Maybe I should consider turquoise - they say it "THE color" of 2010 you know. I have been de-cluttering like mad (I'll have to write about that in a post sometime) and have even packed away most of my kids' toys - how mean am I?? i have lots of color so beige is hard for me, but i know it's what you're suppose to do when selling a house. it's funny how many shades of beige there are- i end up picking colors with good titles usually b/c i get overwhelmed... good luck! I got curious and went and found this list of staging tips on HGTV's website: http://www.hgtv.com/real-estate/30-cant-miss-staging-tips/index.html. I watch a lot of HGTV, but actually had not heard of a couple of these before. How's the housing market where you live? If your house is clean and fresh and priced to sell, should it sell fairly quickly? Glenda, it's official - you are awesome! :) Thank you so much for all the tips and resources. The housing market here is not great. There are a lot of houses in our neighborhood for sale and none seem to be moving. I try to not get too depressed about that but it's not easy. It's also so hard to look at our house from an objective point of view. I have so much emotional attachment to it (good AND bad) so I have no idea how a stranger would see it. I know Vince loved it at first sight and I loved certain parts of it. So, hopefully someone else will have the came reaction that we did.